Longtime friends and now owners/partners, Brandon Bortles and Barry Dobesh-the B’s, as they are branded together–chose the name Abejas to convey the meaning behind the bee. Bees are industrious little bastards that symbolize agriculture, nature, and the fresh provisional menu behind Abejas.Abejas is a homecoming for the owners. The owner-duo met in Golden and both have deep roots in this small town. After Barry graduated from the Colorado Art Institute’s culinary program in 2002, he and Brandon became colleagues at the Hilltop Café in Golden. Barry next spent time working in Chicago, while Brandon moved on to manage New York restaurants. They rejoined in Denver in 2007 and started forming their dream to provide Golden with an intimate, seasonal restaurant, fit for a casual glass of wine with friends as much as for the celebration of a special occasion. Brandon and Barry wanted to stay true to the historic location of Abejas when designing the restaurant. The Abejas location once housed a Piggly Wiggly Wholesale Grocery Store, amongst other businesses. The interior of the restaurant features reclaimed barn wood, corrugated metal, old doors, all from a ranch in Golden that was being sold. 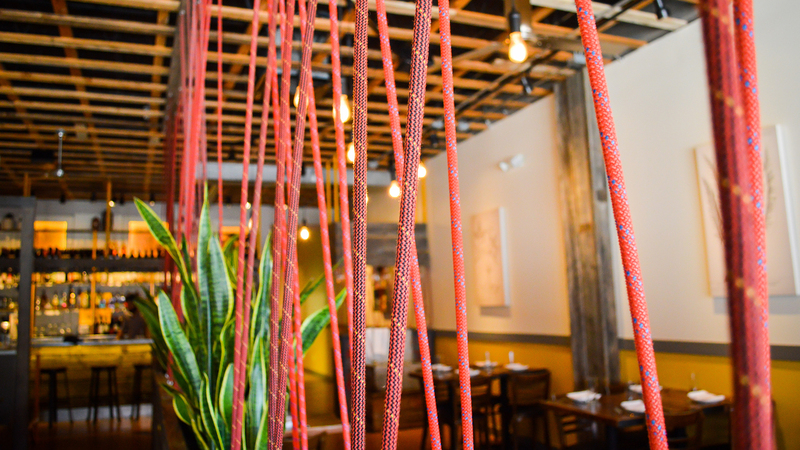 The rustic interior and application of the locally reclaimed material go hand-in-hand with the aspiration to source as much of the menu locally as possible. The two owners hope to foster strong relationships with local farmers, breweries, and suppliers in their immediate community.